When it comes to open-world RPGs, nothing can quite compare to the behemoth that is The Elder Scrolls V: Skyrim. The majesty of its frozen fantasy world stole our hearts when it launched nearly seven years ago, and many of us are still playing it to this day. This is due to Skyrim seasoning gracefully over time – despite its age, the RPG can still take you on an unforgettable adventure. But its staying power is helped along with a little help from its modding community. Returning to those admittedly aging graphics is made easier with new HD textures while new quests can be added to the game by installing fan-made expansions. And if you’re looking for something a little more absurd there’s plenty to keep you entertained – from Randy Savage dragons to fart shouts. Fancy a roleplaying game that isn’t on this list? Here are the best RPGs on PC. 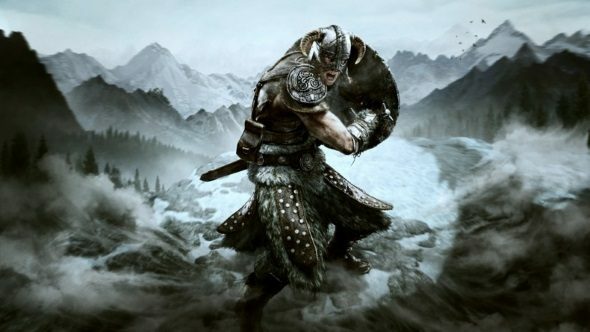 Skyrim has contributed to the rise in popularity of open-world fantasy RPGs, but there are plenty of other games with reams of lore to learn, expansive character customisation, and a dedication to creating an immersive world. If you enjoyed Bethesda’s beast and are looking for something similar then we have a list for you: the top five games like Skyrim. It should at least help tide you over until The Elder Scrolls 6 release date arrives. First on our list is our Game of the Year for 2015, The Witcher 3: Wild Hunt. This is a strong contender for the best open-world fantasy game ever, and similarly to Skyrim, it’s one that continues to blossom with age. Despite being nearly three years old, the beauty of its landscapes, embroidered clothing, and every other visual flourish continues to outshine most of its younger rivals. The Witcher 3 follows Geralt of Rivia, the infamous, silver-tongued-and-haired monster hunter for hire. This third entry in the series is a great entry point into the series as it eases you into its story and combat. It also upholds everything The Witcher is celebrated for, by continuing to champion player choice, giving you the option to pick and choose how to respond to the requests of characters and the exquisitely written questlines you embark upon – from saving children from witches to hunting down a missing frying pan. The Witcher 3 is a game of great length, with some of our own personal experiences taking us from anywhere between 30-250+ hours to complete – demonstrating it’s not only Skyrim that can turn your entire weekends into save game files. We’re expecting to be just as gripped by developer CD Projekt Red’s next project, Cyberpunk 2077. While the Dragon Age series isn’t as long lived as The Elder Scrolls it does have plenty of swords-and-sorcery action to offer across its back catalogue. The latest of which is Dragon Age: Inquisition, the third entry to BioWare’s successful series, which takes place in Thedas – a mystical land host to a variety of kingdoms and dynamic climates. Although strictly played in third-person, as opposed to Skyrim’s typically first-person perspective, Dragon Age: Inquisition is riddled with rich lore and supplies a colourful open world packed with plenty of side missions to keep you occupied. If you love the loot system in Skyrim, you may favour what Inquisition has to offer here; there’s a plethora of weapons and armour, alongside a fulfilling reward system that provides essential crafting materials for your journey. Inquisition also features a roster of charming and witty characters, and BioWare gives most of them a more engrossing narrative and memorable personality than anything Skyrim manages. If you enjoyed the option to marry in Skyrim then you’re in luck, as Inquisition lets you woo and romance party members. Forewarning, though: some of them may just break your heart. +10 to sadness right there. Proving that older games shouldn’t always be put on the shelf, Kingdoms of Amalur: Reckoning arrived in 2012 to little fanfare, but it’s one of PC gaming’s best RPGs. In a similar vein to Skyrim, you’re able to customise your character and class with a combination of skills, weapons, and abilities at your disposal, with a central focus on building your character from the ground up. While there are traditional classes like Skyrim you don’t have to dedicate yourself to one; as a ‘Fateless’ character, you’re free to swap and change your skill tree at any time. It also happens that Kingdoms of Amalur comes from the mind of Ken Rolston, the lead designer behind Skyrim’s predecessors: Morrowind and Oblivion. 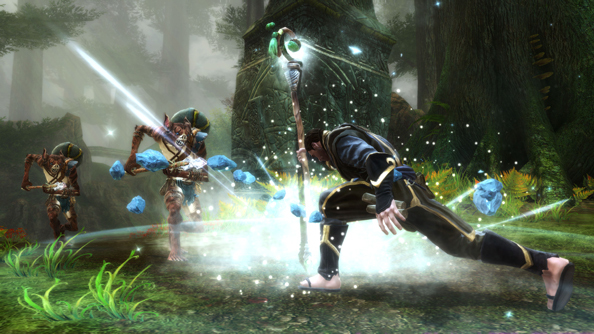 Rolston managed to incorporate some of the Elder Scrolls’ best elements into Kingdoms of Amalur, including its striking environmental design and characterisation that veers away from the typical RPG pitfall of feeling like Tolkien fan fiction. Like Skyrim, Kingdoms of Amalur: Reckoning continues to receive positive reviews on Steam despite being a similar age, and comfortably fits in the category as a well-rounded fantasy RPG. Kingdom Come: Deliveranceis the newest game on this list (you can read ourKingdom Come: Deliverance reviewhere) and so it’s had the benefit of learning from Skyrim, The Witcher 3, and all the other great pre-2018 RPGs. Set during the era of the Holy Roman Empire, it takes place in 15th century Bohemia, where you assume the role of a man named Henry who seeks to avenge the unlawful slaughter of his family. Its non-linear narrative gives you plenty of room to experiment with your choices and playstyle, and its medieval atmosphere is reminiscent of Skyrim’s – sans the dragons, of course – with a variety of ways to approach an objective, including stealth or melee charges. Indeed, of all the games like Skyrim on this list, this is the one that both feels and looks the most like a Bethesda game – there are also plenty of Kingdom Come: Deliverance modsto entertain you. Nuances that Kingdom Come: Deliverance adds to Skyrim’s formula include its survival mechanics, which track your hunger and fatigue, and its dedication to realism when it comes to combat (swinging a sword in full plate armour is a clumsy, difficult affair). NPCs can also react to your appearance (if you’re covered in blood, for example), which affects gameplay during stealth missions; what colour of clothing you wear will make you harder or easier to spot. Best unleash your inner goth when it comes to nighttime sneaking, then. Finally we have The Elder Scrolls Online. 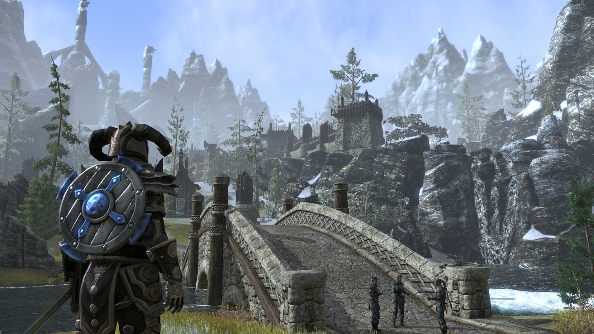 Bethesda’s online entry in the Elder Scrolls series got off to a rocky start upon launch in 2014, but after feedback from its fanbase and gradual refinements to the system, developer ZeniMax Studios continued to refine its MMO to the point that it’s now considered a serious contender to World of Warcraft’s throne. Scrapping the subscription fee opened the world of Tamriel to thousands more players, and the game’s major expansions – Morrowind and Summerset – have been very well received, helping to further fix some of the game’s long-standing grievances. Maintaining the perspective, fonts, and UI of Skyrim to provide a true Elder Scrolls feel, so this MMORPG is definitely worth picking up for fans wishing to extend their Skyrim experience, while still looking for a fresh adventure. Even better is the fact that it lets you explore Tamriel with friends. Everything you expect from an Elder Scrolls game is here – the races, the up-close combat, the sprawling questlines – but it’s transported to a complex, stat-focused MMO. Plus, the Morrowind expansion is pretty much designed for those crying out for a Morrowind remaster.